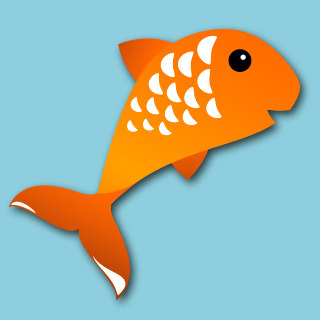 The event consists of three main parts. First, a welcome reception with a few African inspired buffet station style appetizers and beverages including several wines, a rum and mango based cocktail, imported and domestic beers, soda and water. The location of the reception, and the entertainment at the reception will vary, based on the weather. Next, guests will move into the Harambe Theater for performance of a new show created for this event called "The Lion King: Concert in the Wild", complete with a special celebrity narrator (such as Viola Davis, Avery Brooks, and Alfre Woodard, please check with the Disney site for a complete list of narrators and the nights they will be appearing), along with a live mini-orchestra, and choir. 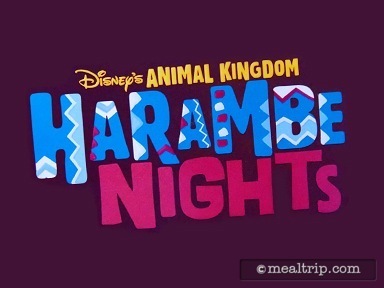 After the 55 minute show, guest will move out in to the third part of the event called the "Harambe Nights Street After-Party" where they will find an assortment of all-inclusive, African cuisine inspired, buffet-style food and beverages (the same beverages listed above in the reception description). A mixture of characters, live bands, DJ's and stilt walkers provide entertainment and photo opportunities (weather permitting of course), and special event merchandise is also available for purchase. It was a rainy night. The welcome reception was crowded. The cheeseburger wraps were delicious and the jungle juice was my favorite. The little egg shaped salads very tasty. I had six. The bamboo lion chow was welcomed. The star,Michael Beach was a hit. The dancers were not seen by most. They need to be up on a stage for all to see. What we saw was entertaining. The weather kept us indoors,so the outdoor entertainment was missed. There was ample foods to try a and easy to get seconds as well as the open bar. To top off the evening a visit from Mickey and Minnie was a treat who took time to pose for pictures. I would like to try again in a different seat to see the dancers and to catch the outdoor entertainment without rain. 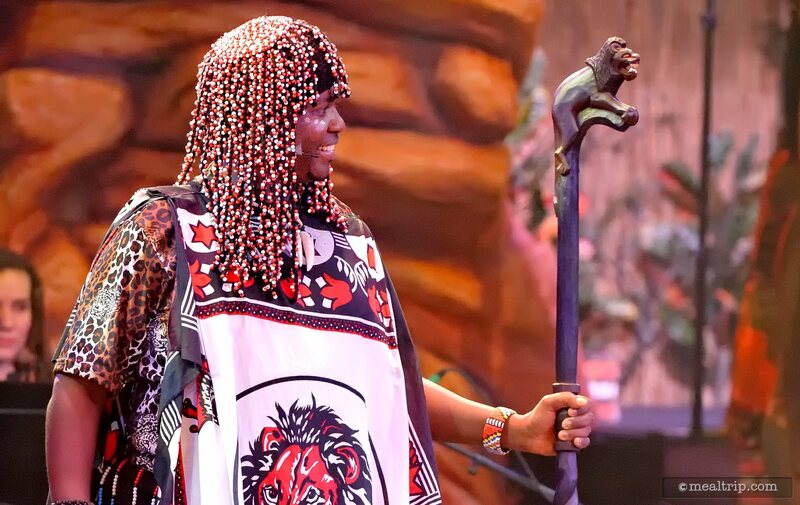 After having a rather melancholy experience on the opening night of Animal Kingdom's Harambe Nights event, I was very curious if a second visit, armed with the knowledge gained at the first experience, would change my mind on this new hard-ticketed offering. The night though, had a plan of it's own, as the rains fell over Animal Kingdom. The opening "welcome reception" was moved from where it is supposed to be held, in front of the new Harambe Theater, to inside Pizzafari due to the rain. The live band that was so enjoyable on opening night, was decidedly absent due to space limitations. 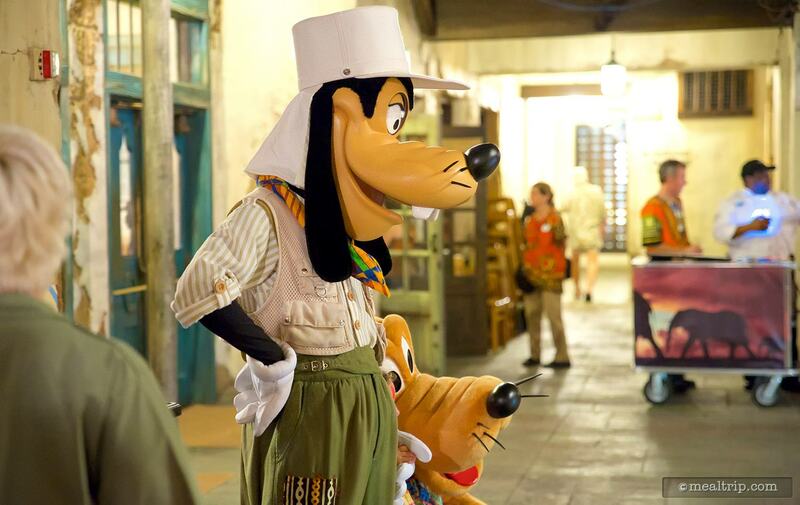 A couple of drummers and dancers tried their best to make their way around to the various rooms, as did a few educational cast members with "show and tell" African items. But alas, the lively atmosphere that seems to be present outdoors, just can't be replicated indoors. The only real plus here is, the air conditioning and tables and chairs that Pizzafari offers. Beverage-wise, you just can't go wrong with Jungle Juice with Rum. The same four wines from the opening night and a couple of imported and domestic beers (Tusker Lager and St George Lager), were still present. I stuck with the cocktail de jure during this segment of the event, and while I can't complain at all, it is worth pointing out that sometimes I received a Jungle Juice with Rum, and other times, I received a Rum with Jungle Juice... if you know what I mean. Much to my surprise, one of the four appetizers (on this night anyway) had been taken away from the welcome reception and moved to the dinner portion of the event... the Moroccan Beef Kefta was nowhere to be found. More on that in a bit. 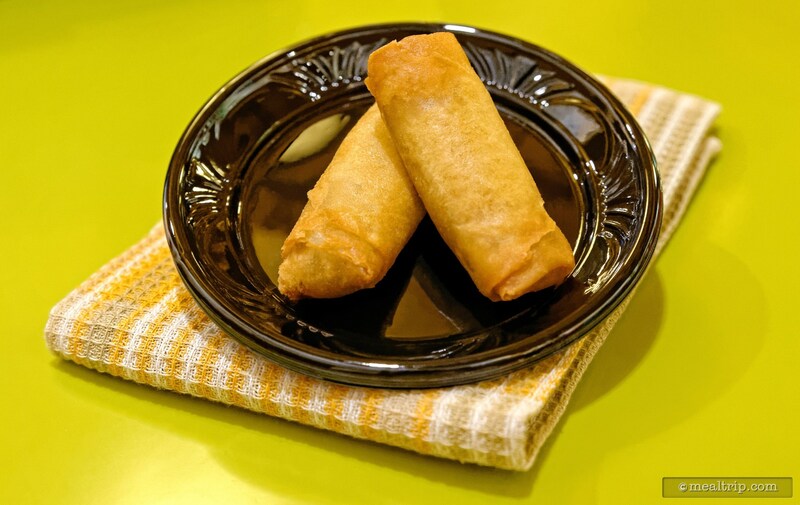 That leaves us with the yummy, (if not very African), Safari Cheeseburger Rolls, which have a great flavor, trapped in a rather lackluster, soggy egg roll-like wrap. 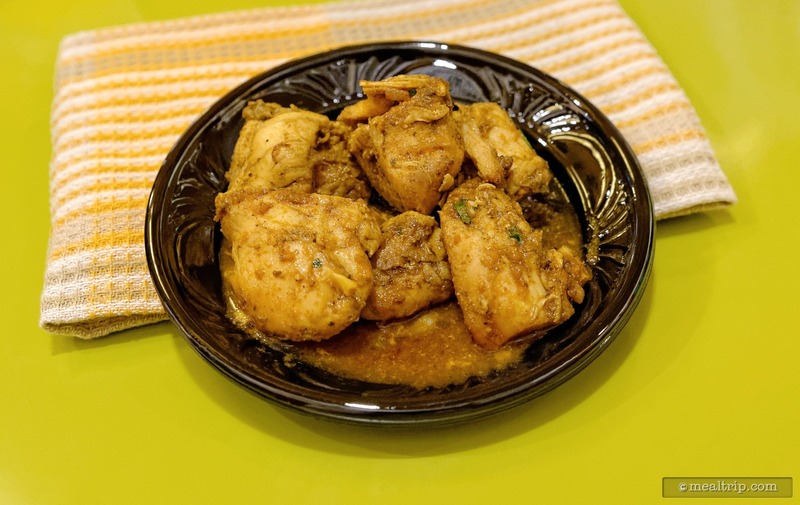 A Spicy Durban Chicken, which is very similar to the Spicy Durban Shrimp at Sanna, but made with cut chicken bits, as the name suggests. 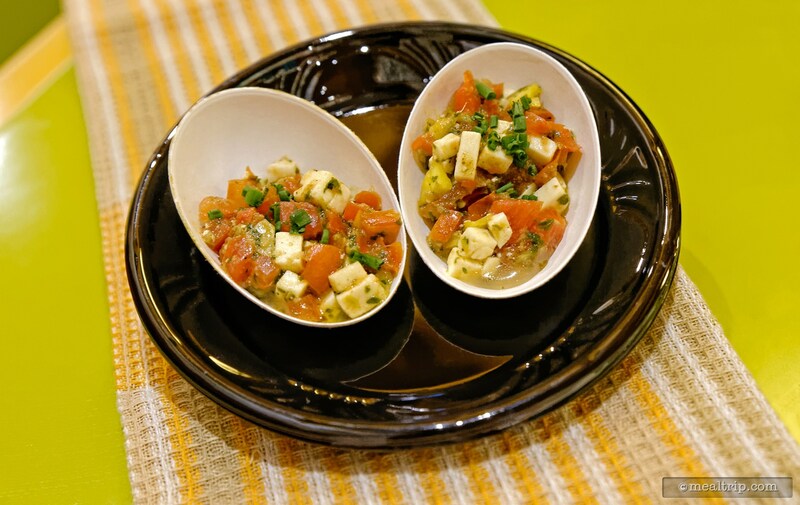 And a Pickled Fennel with Paneer Cheese cup, which is a well flavored and chopped salad-type mix. One of the other curious substitutions at this event, were the plating options. 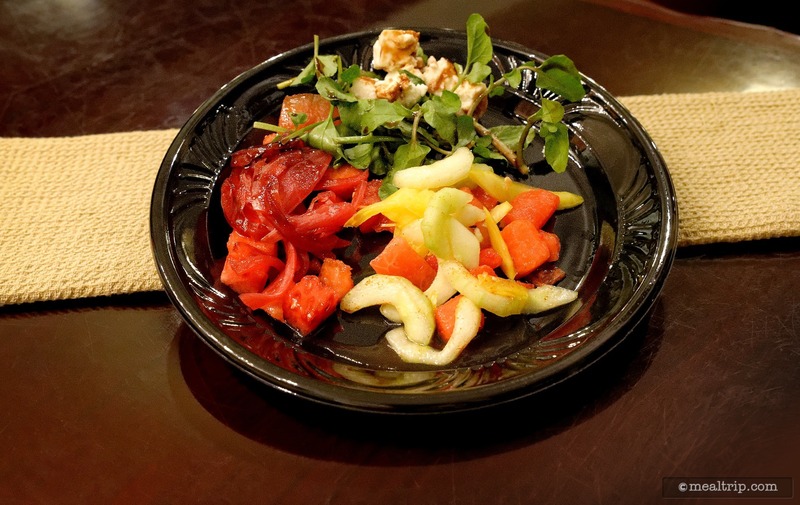 On the first night, we had very thematic, charming, triangle shaped wooded plates for which to put our appetizers on. On this night, we were back to the black plastic small plate and even (gasp) the familiar red, orange and white paper plates that every single counter service location property-wide uses. Which seemed a little low-end for such a premium-priced event. On to the show! I was very happy to find more Jungle Juice with Rum and the full assortment of beverages available just before going into the theater, along with a cute wooden tube of Lion Chow munchies (an African spice-themed dry mix of bread chips, cardamom pecans, golden raisins and dried cherries, along with a few other bits). The Premium seats, I'm sorry to report... still only look "premium" for the first two rows. If you're not first in the theater and end up any further back than row three, the zero-elevation premium seating does not offer much of a view. The seats do have backs though. This time, I was in the "standard" seating area, and had a decent view from behind the premium seats but elevated by a few feet. The show itself still seems to lack any sort of identity, other than being a first-class vehicle for showing select clips of The Lion King movie. 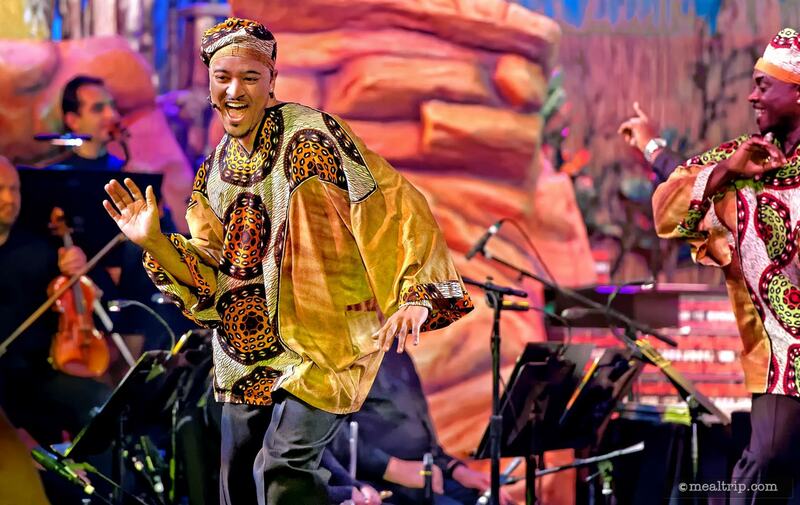 Once again, all the performers, dancers, musicians, choir, narrator and host are top-notch, but I'm left wishing that I could have seen and heard more of them. After seeing most any show, a fun conversation to have with your companions usually starts with "so what was your favorite part of the show"? 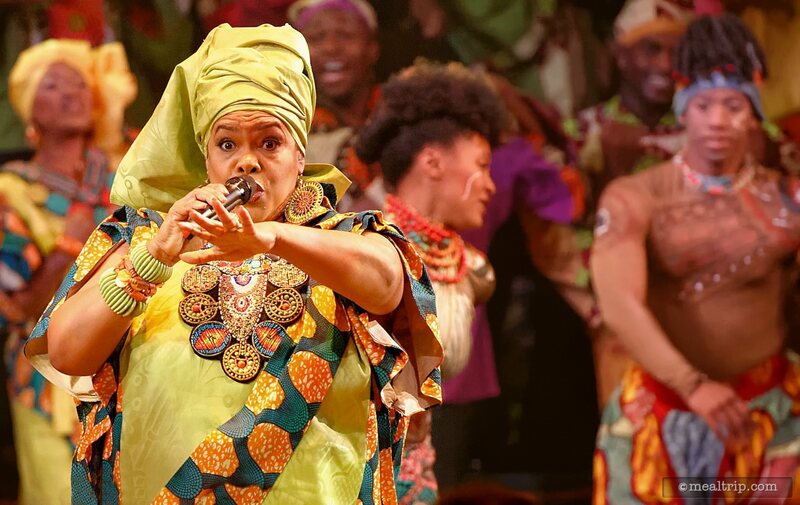 Responses after seeing the touring production of The Lion King included "the costumes were amazing" or "I liked the dancing grass bit". 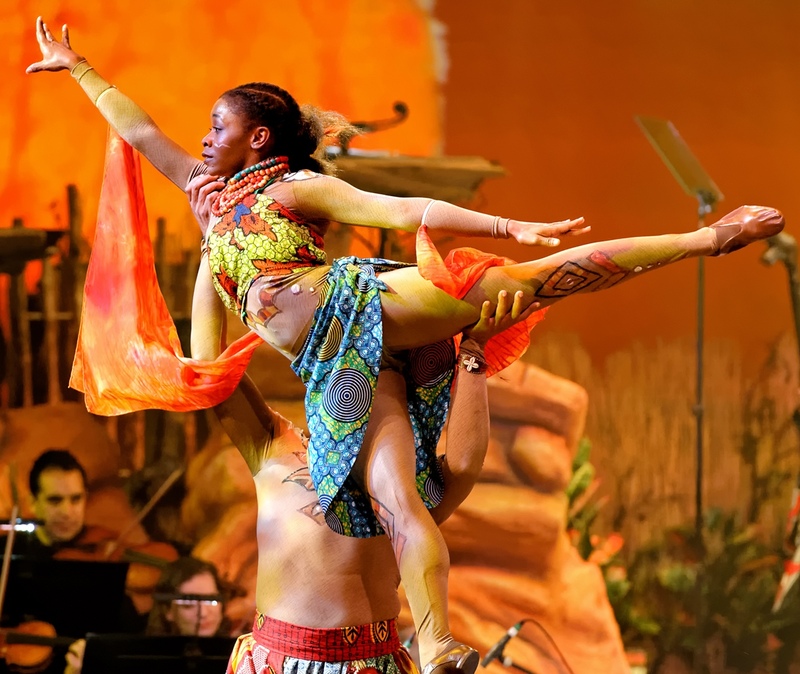 After seeing Animal Kingdom's "normal" daytime performance of The Lion King in the very same theater, comments include... "the flying bird lady was amazing", or "the tumble monkeys were awesome". 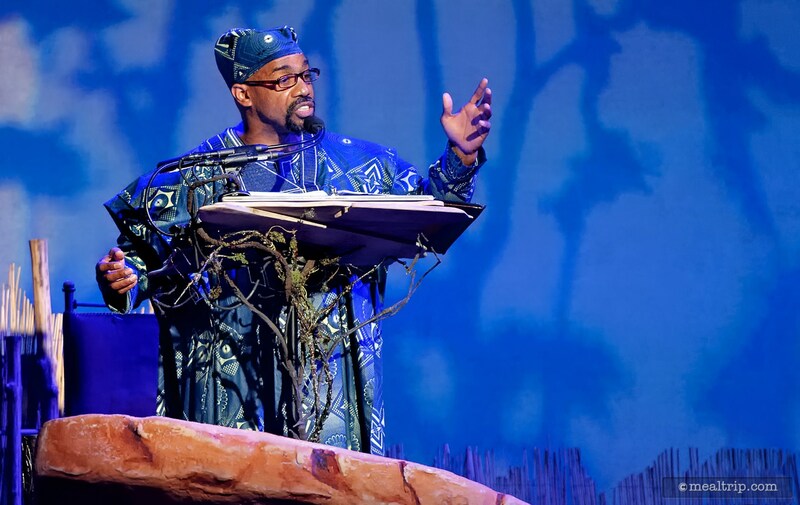 With this "Concert in the Wild", I occasionally heard "well, it was nice seeing Michael Beach" and "the show was good", but little else. It's not due to the lack of talent, because the performers are all amazing... it's just that the show is 55 minutes of the same thing. Once the show was over, the theater doors were opened up onto the Harambe area (which ranges from the theater, all the way down to the entrance of Kilimanjaro Safaris and around the corner a bit, and includes Tusker House), with various food and beverage stations spread throughout the entire area. It had stopped raining just long enough for a bit of the street-party atmosphere to get going, but it never really stopped drizzling a bit here and there all night, so the outdoor party seemed slightly subdued compared to the opening night of the event. Still, music was playing and some stilt walkers and characters from the show were making their rounds, dancing, and posing for pictures. Seating seemed a bit more plentiful as well, which was a problem for me on the first night. It's hard to tell though, if it was because of the rain, and guest just weren't sticking around after dining. The food quality, is about the same as on opening night. 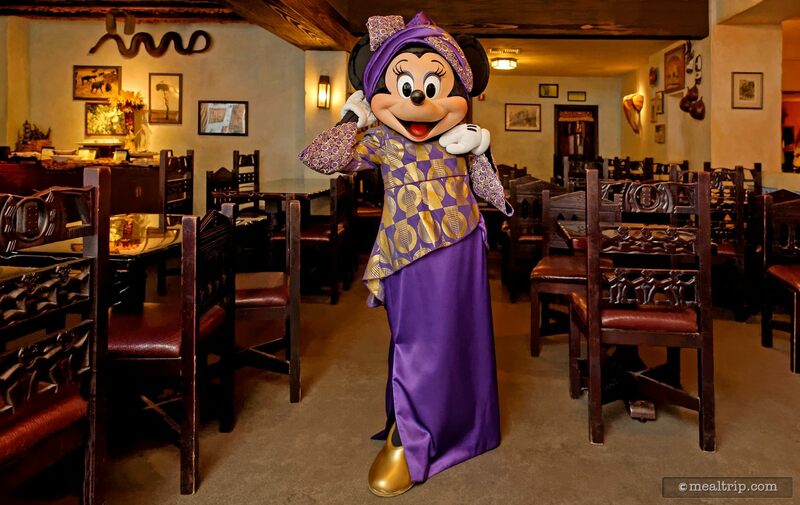 It's Tusker House buffet style dining, and there's nothing wrong with that. Tusker House is one of my favorite restaurants in Animal Kingdom. It just seems that some of the marketing copy that was written prior to the event, was hinting at a slightly elevated culinary experience, and so my expectations were a bit higher what the event could deliver. Missing in this "dinner" portion of the evening, were the cool wooden-esque plates and dishes from the opening night event. It seems black plastic and standard issue red, orange and white paper plates were being used. Which, is too bad. It doesn't really effect the food quality at all, but it was one of those special touches that you talk about long after the event was over, as they just made everything feel more like an African street party. 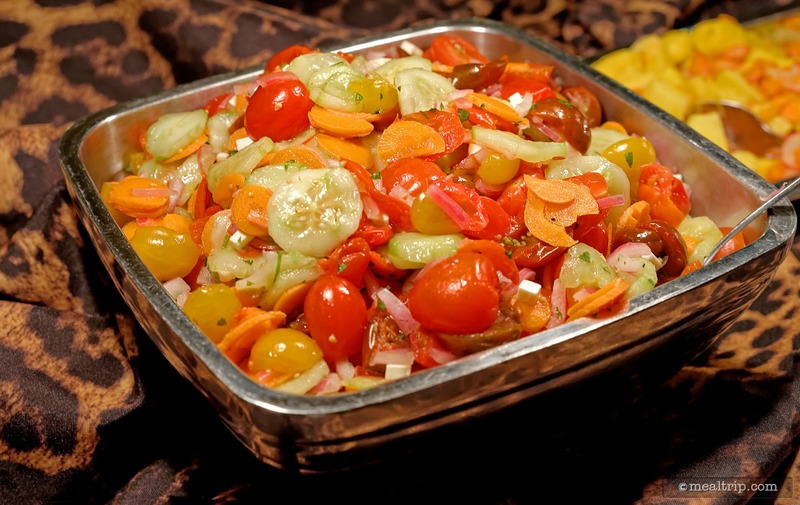 Food-wise, the prepared salads, breads and dips, were all delicious as were the hot "sides" such as the vegetable samosas and coriander roasted potatoes. Several guests that I had talked to on opening night, stated that one of their favorite items on the menu had been the seared Lamb Chop. I'm sorry to say, that was missing (from the July 5th event anyway) entirely. In it's place, I found one of the "welcome reception" appetizers, the Moroccan Kefta. On opening night, the Kefta was beef only, and now that it's been moved to the dinner portion of the evening, it's a Beef and Lamb Kefta. Ahhh... that's where the Lamb went. Personally, I wasn't one of those that found the lamb chop from previous events too appealing anyway. The addition of the ground lamb in the Kefta really elevated that dish to something that was much better than before. Still, it's sad to see a whole protein item to have been removed from the menu. 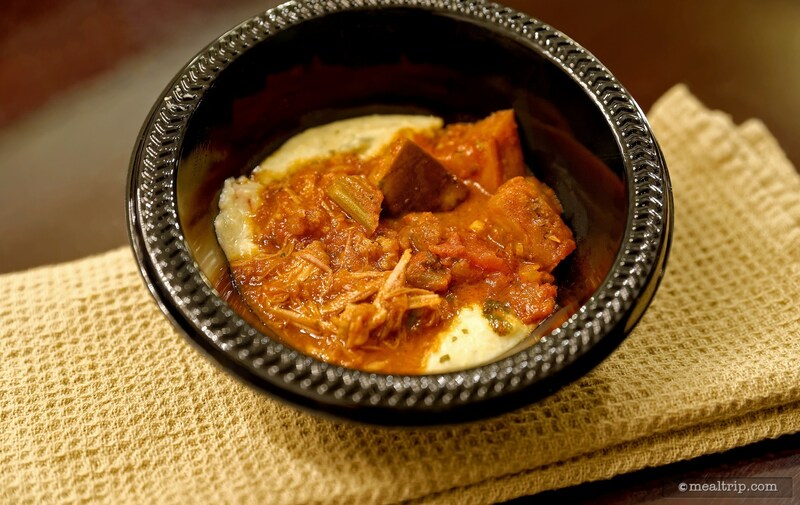 Of the two slow-cooked offerings, the Fork Tender Peri BBQ Pork over Creamy Goat Cheese Pap was my favorite. The Butter Chicken dish did have a similar flavor to the dish served at Sanaa, but the chicken itself was a bit dry. Most of the saucy goodness that the Sanaa version offers, is sadly missing from this variation. The dessert offerings are somewhat more fruit-based, which is fine. After all food being offered, there's not much room left for dessert. 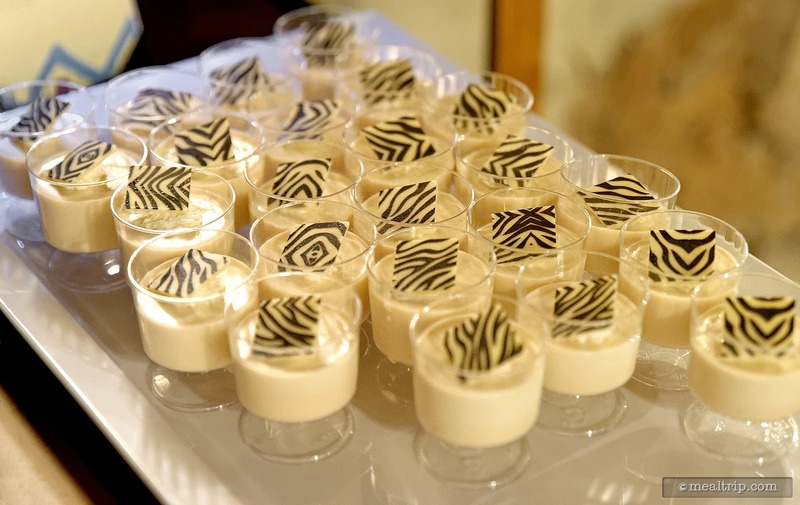 The one dish that still surprised me is the Chai Cream topped with a small Zebra Stripe Chocolate Square. The flavors there, are very unique, and worth a try, if you like tea-flavored things. If you're more into chocolate, there are Chocolate Kenyan Coffee Bites (small brownie bits). Those, for me, were a bit dry but had a good flavor. Once I poured a little of the Amarula Caramel Sauce that was intended for the apples, over the Chocolate Bites, they were spot-on. 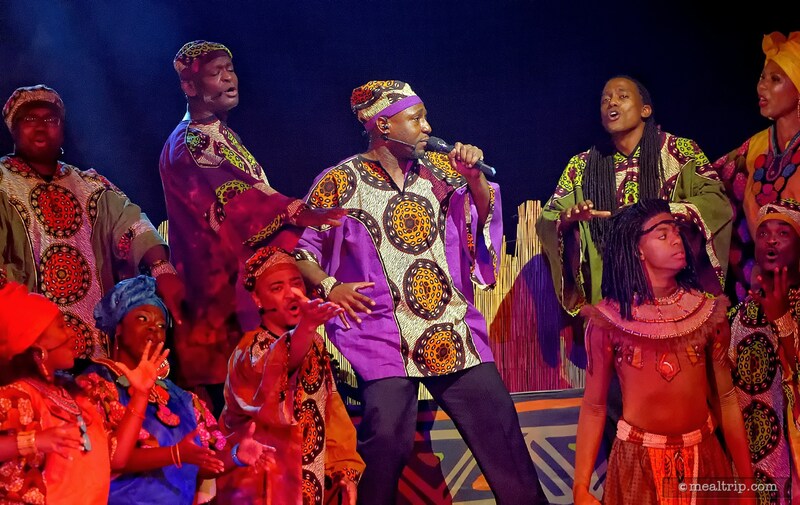 All in all, I had a better time on this visit to Harambe Nights, than I did on the opening night, but it's still not yet once of those top-notch, polished, amazing event experiences that Disney has produced in the past. It felt a little overpriced for what it is currently, but that could be easily changed. A few "high-point" memorable, performance segments could be added to the show, and the food quality could be taken to a higher level. Once of the interesting foodie talking points in our group was, "where would you rather eat, here at this event, or Tusker House on a normal day"? Tusker House on a normal day won by a slight margin, which is too bad, but not surprising to me. It will be interesting to see if this sold-out event will be duplicated next year, and turned into an annual event. One would hope so, because it's always nice having a wide variety of special events and options to choose from. If a few tweaks are made here and there, Harambe Nights could be a really special, special event.